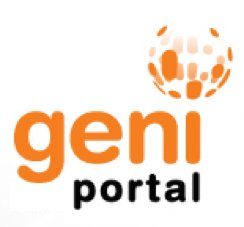 You may be able to log in to GENI without having to get a separate account! If your institution belongs to an identity federation such as InCommon (US) or CAFe (Brazil), you will likely be able to log in using your usual username and password. Go to the GENI Experimenter Portal. Enter and select your institution’s name. You will be redirected to your institution’s page to log in using your usual username and password. You will then be redirected back to the GENI Portal. You are now logged into GENI! If your institution does not appear when you type its name, apply for an account at the NCSA Identity Provider. You must belong to a GENI Project before you can run experiments in GENI. Only Project Leads can create Projects. Project Leads must be full-time faculty or senior members of non-academic institutions. If you qualify, you may request Project Lead privileges by logging into the GENI Portal and selecting Profile under the tab with your name. The GENI Concepts page has more information on GENI Projects and Project Leads. The GENI Tutorial Repository includes step-by-step tutorials to help you get started.